The new Unimog U529 sets a new standard as a robust and versatile specialised truck, delivering on the Mercedes-Benz "trucks you can trust" brand promise. 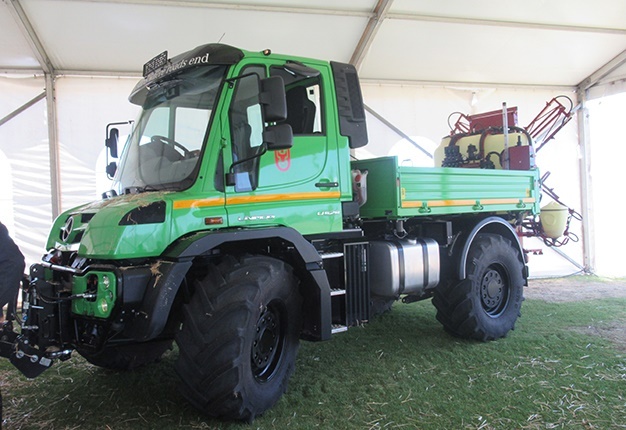 The U529 is a new concept in the South African agricultural industry offering significant farming versatility with haul speeds of up to 80km/h. It employs a six-cylinder 7.7-litre Mercedes-Benz OM 936 Euro 5 engine, that is equipped with an engine compression brake and offers maximum torque output from as low as 1150 rpm making this an exceptionally flexible engine. It is exceptionally fuel efficient when compared to a conventional agricultural tractor when employed in applications requiring high speed or high power to weight ratio. It has an optimised weight distribution providing excellent traction when required to pull hard as well as safe and predictable handling when running at high speed on the road. The key concept behind the U529 is its amazing versatility allowing it to be used in all four seasons, fulfilling agricultural roles including manure spreading, high-speed haulage, crop spraying, fertiliser spreading, mowing, raking, baling, firefighting and combine harvester chasing. • 40t gross combined weight, offering a legal payload of up to 25 tons with an appropriate trailer configuration. It is designed as an implement carrier, adapted for agriculture use, with the added speed of a truck, and incorporates Mercedes-Benz safety technology. 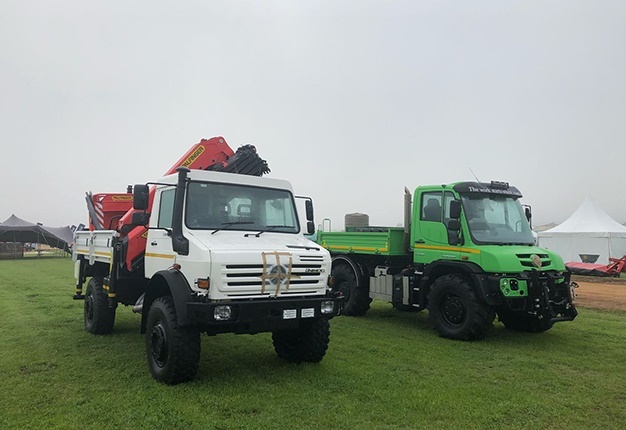 The Unimog is custom built to meet each end users requirements and can be specified in a large number of different configurations for each customers exact application. • Mercedes-Benz OM936 Engine 7.7 litre 6 cylinder inline engine producing 210kw and 1150Nm. • Side mounted cooling system with reversible fan. • Unimog UG 100 8 speed automated transmission including a working range for a total of 16 forward and 12 reverse speeds. • An 85kw 0 to 50km/h infinitely variable hydrostatic drive for operations requiring constant engine rpm or precise speed control. • A Cat 2 front three point linkage plus a Cat 3 rear three point linkage. • A closed circuit variable displacement hydraulic pump offering up to 1 10l/min with a maximum pressure of 240 Bar. • An optional open circuit gear pump arrangement is available which is capable of offering 2 x 1 25l/min @ 280 bar for use with implements such as hydraulic mowers. • A fixed 80mm trailer ball hitch rated for three tons imposed load. - Gross vehicle weight 13 500kg on 495/70R24 Agricultural lug tyres, can be increased to 15 500kg on 385/65R22.5 truck tyres. - Gross combination mass 40 000kg. • Brake system is a full air system actuating dry discs on all four wheels with a fail safe spring actuated parking brake on the rear axle. • High speed trailers can be braked via a the standard full air trailer brake system. The UGE Unimog family which the U529 belongs to has been on sold in Western Europe for three years now and the product is selling especially well in what is known as the "Agri–Schlepper" or agricultural haulage role because of the high productivity and low fuel consumption offered by the Unimog product. It has been extensively tested by the German DLG Test Center (German equivalent of Nebraska Tractor tests) and been proved to be more fuel efficient than standard agricultural tractors in roughly 70% of the roles where standard agricultural tractors are employed in Western Europe. This raises the question of why doesn’t everyone use a Unimog? The answer is that mid-range (100-200kw) tractors are ever more employed in roles (such as road transport and PTO work) where brute pulling power is not necessarily required all the time, which has created the need for a machine like the Unimog. The Unimog is not intended as a replacement for front-line tractors working in primary tillage applications like ripping and discing where large tyres (or tracks) and heavy iron is the only way to get the work done. The product’s market niche is those applications where the power to weight ratio, speed and versatility are crucial. The idea behind it is to buy the farmer or contractor time, by performing those tasks not requiring massive drawbar power faster than a conventional tractor and using less fuel while doing so. This positions the product perfectly for applications such as spraying, spreading, mowing, silage cutting, baling and transport style work such as combine chasing and manure spreading. The Unimog U529 comes standard with a 4 year/or 5000-hour warranty.